Please join us at Milford Public Library on Wednesday, September 19 at 7:00pm for a presentation by Richard Taylor, Master Wildlife Conservationist from the CT DEEP Wildlife Team. 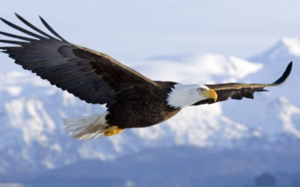 This presentation will include the history, range, habitat, diet, nesting, breeding and recovery of Bald Eagles in Connecticut. Richard Taylor is a retired Human Resources executive who formerly worked for General Dynamics and Computer Sciences Corporation. He has a passion for learning and continuous education and had served as a Chief Learning Officer, a member of the Federal Committee on apprenticeship and Rhode Island Vocational Council and has degrees and certifications from SCSU, RPI and Cornell. Taylor has had an interest in wildlife and fisheries his entire life, and since his retirement, he completed Connecticut’s Master Wildlife Conservationist program and is now active volunteering and presenting programs to libraries and nonprofit organizations.